Taming My Inner Fat Child : If A Little Is Good, A Lot Must Be STUPENDOUS! If A Little Is Good, A Lot Must Be STUPENDOUS! This has been a week of being faced with character flaws. I guess that's good because without seeing them, I have no chance of changing them. Earlier in the week, I was faced with my fear of conflict. Yesterday, I was faced with my faulty thinking of "if a little is good, a lot must be better". I am aware that I carry this idea in all areas of my life. I think it's part of my 'sprint or stand still' mentality - doing all or nothing. It affects my eating, my spending, my exercising, my sleeping, my creating, my parenting, my emoting, my planning, my cooking, my cleaning, my Facebook posting, my picture taking, my bang cutting, my lipstick putting on, my drinking ....... everything. 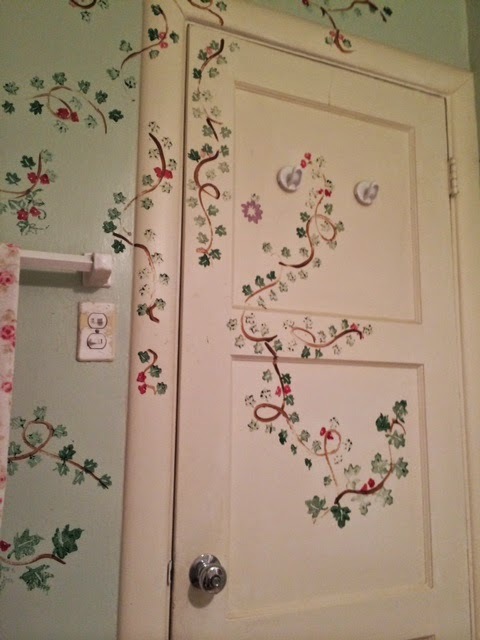 Yesterday, I decided to paint some vines in my guest bathroom. I am a seasoned vine painter. 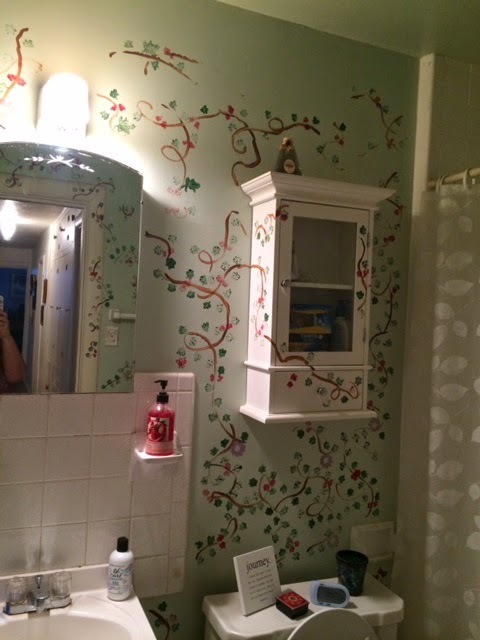 I painted vines in my kitchen in a house I used to live in. Nina and Donna were with me at the time. Donna finally said "STOP! You're making it look like Jumanji!" Well, yesterday I was home alone. In hindsight, I shouldn't be left unattended when I have paints and stamps in my hand. 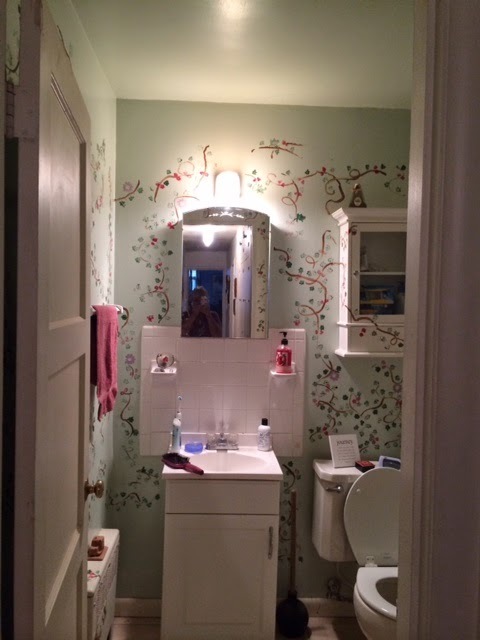 I started out with a plan to make one long, brown vine stem that started at the floor on one wall and crossed the bathroom door to the other wall, ending close to the bathroom ceiling. However, once I started with the brown paint, I couldn't stop. I ended up with probably 100 vine stems that started nowhere, ended nowhere, and were connected to nothing. 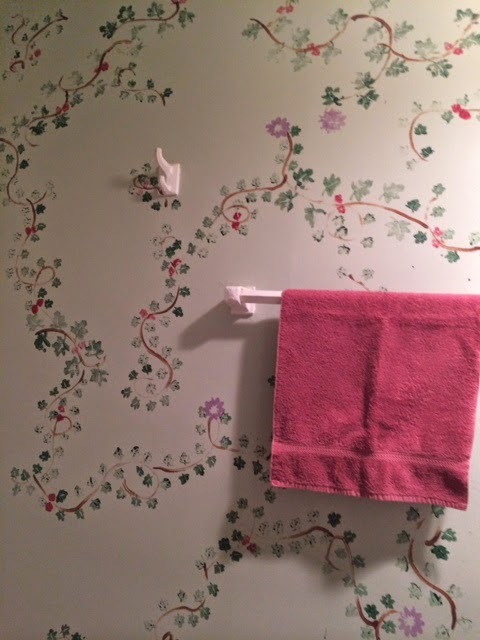 Once I covered the vines with leaves, I needed to put little flowers on them. The problem was that I had more than one flower stamp and more than one favorite color to use. So my vines have two totally different kinds of flowers in two colors on them. It crossed my mind that that wasn't very realistic. But then I reminded myself that neither are vines floating in space not connected to anything. I ended up with this. IT'S TOO BRIGHT! IT'S TOO BUSY! ! IT'S TOO MISMATCHED!!!!!!! TURN YOUR HEAD TO THE RIGHT! OH MY GOD!! RUN FOR YOUR LIFE!!!!!!!!! I obviously went on a vine bender. Which brings up another example of my faulty "If a little is good, a lot must be better" thinking --- my drinking. When I was drinking wine, I would start out with a wine glass. However, I would fill it to the brim with red wine. I was 57 before I learned that those big ole red wine glasses are not supposed to be filled to the top. I just always thought fancy restaurants were being stingy and cheating me out of a whole glass of wine. With my "........ a lot must be better" thinking, I gradually started drinking my wine out of water glasses. The day I quit drinking, Donna had made me a drink of cranberry juice and vodka. It was tasty but it had just a little tiny bit of vodka in it. I made my 2nd one - and my 3rd one - and the 4th - with the thinking of "If a little bit of vodka is good, a lot of vodka will be wonderful!" I did that until I threw up all over Donna's house, Donna, my daughter, my foster daughter, and myself. So, I went from being a "sprinting" drinker to a "standing still" drinker - meaning not drinking at all. Life is much better this way. And, of course, I do this with eating. After making good choices around food last week, this week is Teachers Appreciation Week. There has been food everywhere, every day. I have partaken in it all - even though I'm the counselor, not a teacher. We don't get food on School Counselor Day. I'm making light of this but it really is a serious thinking flaw. I need to change my thinking from "If a little is good, a lot will be better" to "A little is enough". A little bit of vines is enough. A little bit of facebooking is enough. A little bit of bangs cut off is enough. A little bit of ketchup is enough. A little bit of guilt is enough. A little bit of spending money on myself is enough. A little bit of calling Tyler to check on him is enough. A little bit of 60th birthday party plans is enough. A little bit of cheesecake is enough. A little bit of enchilada is enough. A little bit of lipstick is enough. A little really is GOOD enough. This is what the Universe has put in front of me to work on right now. A little bit is enough. I don't need to obsess on it. I need to sit with the idea and observe how it impacts my life. Then, a little bit of change will probably be enough. I like it. In your house. :) Moderation is good. Hard but good. 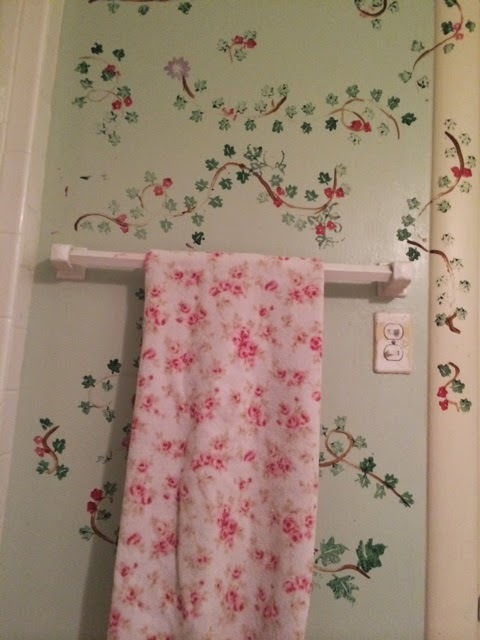 You know that I love vines like this because I had them in my house. I love the way it crosses the corner of the cabinet and the way it comes down the wall and onto the door jamb. It loses something when it is free floating, not attached anywhere. I like less than this for the same reason I don't want a dozen roses, too much to be able to actually see it the way I would want to be able to see it. P.S..the unknown poster in your blog is me...Meghan Michelotti. Glad to know that, Meghan!